Being kidnapped by Katherine Grainger was definitely the last thing I had expected when meeting the Olympic Rowing Champion earlier this week. So there I was, a passenger driving somewhere (I still have no idea where I ended up!) 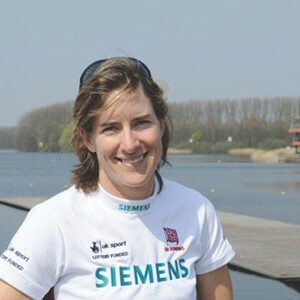 through London with Britain’s most successful female rower, chatting about the greatest highs and darkest lows of her extraordinary career, the development of women’s rowing and why it is so important to share her story. To be honest, its never something I thought I’d do. As an Olympic-sport athlete, I don’t do my sport in any way because of fame, celebrity or money – I am very true to rowing and I have never looked for any attention that comes with it. But with the book, a lot of people had said to me that I have such an inspiring story and people should hear about it. But it was really important for me when writing it, that is wasn’t all just about me, but also about the journey of the people who have been crucial in helping to develop the sport and me as an athlete. I felt their stories needed to be told too. 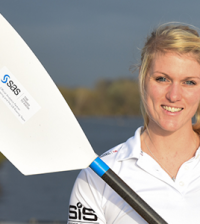 You’ve been competing for 15 years, how has women’s rowing changed in that time? Women’s rowing has transformed massively. In the mid to late 90’s people had no idea about it. 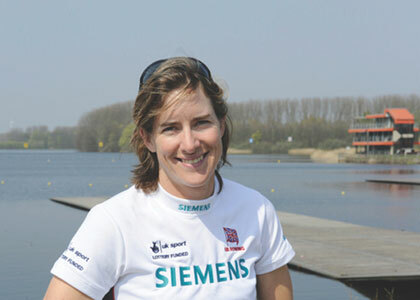 When I won my first Olympic medal in 2000 I had someone come up to me and say “I didn’t even know that women rowed!”. Its only 12 years after and we’ve won three gold medals that everyone knows about women’s rowing. For me that’s also a nice story to tell. What was the most difficult thing about writing the book? The difficult stuff wasn’t necessarily the hard things I’d found in my career, more looking back on my childhood which I had never really thought about. I looked at some of my old diaries and it was so evident that I didn’t know what I wanted to do with my life – I was very lost with no direction and I found that very poignant. It’s a lovely position to be in now, having experienced so much and had a brilliant life. Winning three silvers, but not yet that gold before London 2012, how much drive did that give you? I do consider that a lot, if I had won a gold previously would I have continued with my sport? I didn’t know after Athens whether I would definitely continue to Beijing, but decided to and obviously it was the right decision to go on – even though the result wasn’t quite what I had wanted! It does make me think, if I had got what I wanted back then, would that have been enough? I don’t think it would have been, because yes the main driving force was to get the gold and continue to London, but also I really felt that I wanted to get and give more to my sport. I didn’t feel like I was done yet and I think even if I had won, I still would have felt that there was more that I wanted to do. So London 2012 arrives. Did you feel and worry about the huge pressure, especially with the chance that again it might not go your way? The way I felt after Beijing I really don’t think I could ever feel any worse. The loss of that Olympics was so powerful and I really struggled with it, I cant imagine that if I lost again it would be as bad. And at least I knew I could survive it, it feels like the end of the world, but its really not. The London games was always going to bring the greatest pressure and attention, but I think both Anna (Watkins) and I didn’t really appreciate the scale of it until after we won. Which is probably a good thing! I think London came at the right time for the both of us. We were both very experienced and we were always really enjoying ourselves competing together so by the time the final came we were excited just to get on with it. We were so ready. Describe how it felt to finally win that gold medal? I really don’t think I have the words. I just wish I could have put everyone in that moment. It wasn’t relief which people expect. My first emotion blew all my expectations out the water. It was on a scale of joy that I cant even find the words in the dictionary to tell you! Until we crossed the line I didn’t let myself believe it and then you see and you hear 30,000 people with all their Union Jacks. The roar and reaction from everyone when we crossed the line was immense, we just knew what we’d done. The lovely thing about rowing as well is that there was just the two of us in the boat to enjoy this amazing moment. We’re isolated in the middle of the water surrounded by thousands of people celebrating, but no-one can reach us. How crazy has the last year been? Nuts! I thought the build up to the Games was going to be crazy, but afterwards its nothing like I would have imagined. For the five months after the Olympics until Christmas it was just 24/7 celebrations and reliving it. I went to Awards, and dinners and charity events…you name it I went to it! That summer was a once in a lifetime experience so I just wanted to soak it all up. 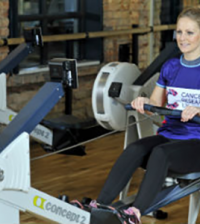 Have you got back into rowing yet? Not yet. I said to my coaches that I wouldn’t be going back to rowing this season. I really wanted to finish my PHD in criminal law for one thing. I had been doing it for years, but really needed to get it finished – I graduated last week so now I am officially a Doctor which is cool! And obviously I’ve been focusing on the book and then working for the BBC doing some rowing coverage, so I’ve been busy exploring different things and finding what else interests me. 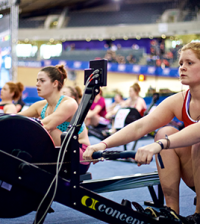 What is next for you and your rowing? I still haven’t made that decision. I genuinely haven’t had a break so I need to stop, sit back and take a look and seriously consider all the options. If I go back to rowing I can go back for Rio which is the first choice, but that stops a lot of other things that I’ve been enjoying. I can’t quite decide until I stop fluctuating with a decision. I’m at the point now where I know I’ve had almost the perfect career which means maybe it’s a good time to end on a high and look to go on to other things. 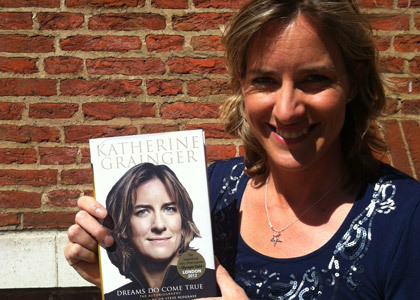 Katherine’s autobiography ‘Dreams Do Come True’ published by Andre Deutsch, is out now RRP £20. To buy it just click here, but if you fancy one with an autograph, we’re offering you the chance to win one of five signed copies with our exclusive competition! Click here to enter.